Serve this delicious easy-to-make blackberry cobbler topped with vanilla ice cream; the perfect dessert for any meal! In a medium bowl, stir together the blackberries and sugar. Let stand until fruit syrup forms, about 20 minutes. In a large bowl, stir together the flour, baking powder, salt and milk. Stir in the melted butter until blended. 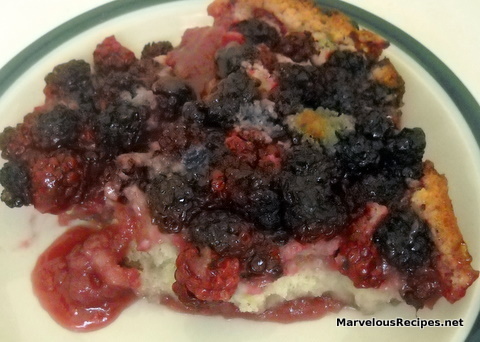 Spread batter in an ungreased 8×8-inch baking dish; spoon blackberry mixture over the batter. Bake at 350 degrees F for 45 to 55 minutes or until dough rises and is golden brown. Serve warm with ice cream, if desired.